KDH Projects were privileged to tender work for the UK’s prestige’s manufacturers and distributors of breaded – based products at one of it’s sites in Saint Helens. 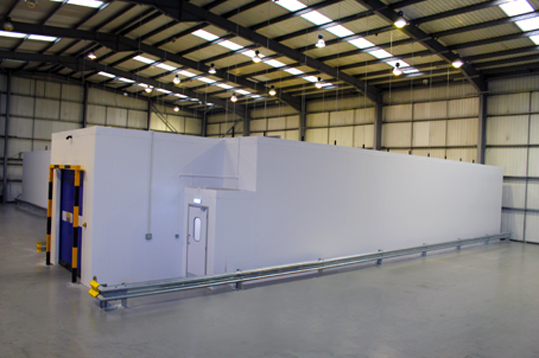 The client’s requirement a bespoke distribution chilled facility module to be utilised for overnight storage and to increase chill chain efficiency in logistics. Construction started on the build 20th December 2017. Throughout KDH Projects worked to minimise site disruption, to provide the best solution for the client to keep their warehouse operation running smoothly. Work comprised of: Insulated paneled l walls and ceilings using PIR core fire check panels. Fire walls using mineral fibre panels and doors to meet health and safty 60-minute fire rating requirement. Unique dual-curtain chilled doors, shutter system for high speed efficiency for excellent insulation performance, cooling refrigeration ventilation installation and electrical fittings. Crash barriers installed, internally and externally to warehouse as a health and safety upgrade, the total project took just over a month to complete. KDH Projects provide a turnkey service and pride themselves of in-house teams of specialised professionals without the resort to use of sub-contracted direct labour.